L-R: Olumide Akintayo, Immediate Past President Pharmaceutical Society of Nigeria (PSN), Ahmed Yakasai, President PSN, and Emeka Duru, National Secretary PSN during the Council meeting of PSN at Pharamcy House, Anthony Village, Lagos, recently. Members of the Pharmaceutical Society of Nigeria (PSN) rose from its first National Council meeting and alerted on dangers of moving drug matters to the Concurrent List, saying it may constitute a setback to the fight against fake drugs. Specifically, PSN has warned that any attempt to move drug matters to the Concurrent List would worsen the fake drug syndrome, drug misuse and abuse as well as other bottlenecks in drug distribution networks in the country. The warning which was contained in a communiqué signed by Pharm. Ahmed Yakasai and Emeka C. Duru, President and National Secretary, respectively, issued at the end of the meeting held at Pharmacy House, Lagos, recently. The communique reads; “The council drew attention to a recommendation of El-Rufai’s APC Restructuring Committee that proposes to move drug matters currently on the Exclusive List (item 21 of part I of the second schedule of the 1999 Constitution) to the concurrent list. The APC had last year set up a 23-member committee led by Gov. Nasir El-rufai, to articulate its position on restructuring, with a charge to the team to engage in deep and wide consultations such that its final report will engender credibility and broad acceptance. The meeting also critically appraised contemporary matters in the pharmaceutical sector and the totality of the health system in Nigeria. On the statutory responsibilities of the Consumer Protection Council (CPC), PSN praised the recent landmark ruling of the Federal High Court, Abuja, in December 2017 for declining to approbate any responsibility to CPC. The responsibility declined by the court include the CPC bid to partly regulate and control pharmacy practice as well as exercise oversight responsibility on the pharmacy profession in Nigeria. The PSN Council advocated strong collaborations between the Pharmacy Council of Nigeria (PCN) and other agencies like the CPC. PCN has specific powers in law to regulate and control pharmacy practice in all its aspects and ramifications in the country. In view of such collaborations, the PSN Council counseled that reports of cases on breaches which are brought to the attention of the CPC should be transferred to the PCN to enable it invoke appropriate sanctions. It called for harmony at the Secretariat of the National Health Insurance Scheme (NHIS) in Abuja where there is controversy over the reinstatement of the erstwhile suspended Executive Secretary of the Scheme, Prof. Usman Yusuf. The reinstatement of Yusuf, who was alleged to have misappropriated N919 million, has generated controversy among different stakeholders in the health sector. After his suspension by the Minister of Health, Prof. Isaac Adewole, last year June, and probed by a body constituted by the minister, President Muhammadu Buhari, in a letter signed by his Chief of Staff, Abba Kyari on Tuesday, February 6, recalled Yusuf. After reviewing the poor coverage rate of social health insurance in Nigeria, which was put at less than three per cent after 12 years, the Council called for a check on the unproductive drift of the NHIS. It observed with regret that NHIS is supposed to be a private-sector driven agenda, but is drifting towards a public sector project. The Council of PSN therefore called for a check on NHIS. Consequently, it also demanded for a proper definition of what constitutes a primary care centre. Similarly, the group sought the entrenchment of a lawful payment mechanism in the operations of the social insurance scheme. The Council further frowned at the slow pace of Federal Ministry of Health (FMOH) in actualising central internship placements of interns in all cadres of health professions in the country. It reminded the FMOH that PCN championed a proposal on commencement of central placement for interns in the pharmacy profession to the Health Minister. The Council urged the FMOH to commence the central internship placement as its initiative by removing the bottlenecks which are unduly delaying the Federal Executive Council’s (FEC) noble interventions. Also, the Council of the PSN lamented the delay in the adjustment of the Consolidated Health Salary Scale (CONHESS) unlike the Consolidated Medical Salary Scale (CONMESS) which was adjusted since January 2014. It also noted with regret that the Federal Government approved another round of increment coupled with enabling circulars within four weeks in favour of the CONMESS structure. The communiqué warned the Federal Government on impending industrial action by health workers over failure to meet their demands at the end of a 21-day ultimatum which expires on March 1, 2018. It stated; “Council expressed anxiety at the level of restiveness of health workers which has led the Joint Health Sector Unions (JOHESU) and AHPA to declare another 21- day ultimatum to the Federal Government effective February 8, 2018. Furthermore, the council urged FMOH to facilitate an IT platform which centralises information about registered drugs, products, pharmaceutical premises, including business partners in line with the template of the National Council on Health’s policy. It further enjoined the FMOH to ensure that the IT platform be coordinated by the PSN, PCN and National Agency for Food and Drug Administration and Control (NAFDAC) under its, the former’s supervision. 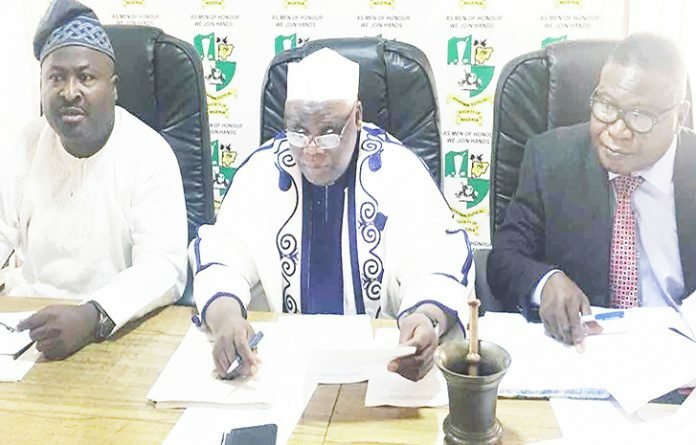 The Council strongly urged the National Universities Commission (NUC) to finalise its working arrangement with the West African Postgraduates College of Pharmacists (WAPCP) to open windows for students of the college to embark on academic postgraduate training. The postgraduate training which is to take place in Nigerian universities should be specially tailored to enable them to speedily conclude their Masters and Ph.D programmes, it said. It also called for a special training for media personnel on drug abuse and misuse in line with its corporate social responsibility outputs, saying it would provide detailed insights to abuse of codeine, narcotics medicines and drug misuse episodes in the health system. The council then endorsed the proposal of PCN, National Institute for Pharmaceutical Research and Development (NIPRD), NAFDAC to collaborate with the PSN on its training proposal. It condemned the non-appointment of pharmacists on the Boards of Federal Health Institutions as representatives of other health professionals as provided for in the Teaching Hospital Act. The council advised the Federal Government to adopt international standards which places premium on the availability of safe and efficacious drugs in the health systems of any nation. It insisted that credible healthcare is built on a flawless drug supply scheme which only registered pharmacists can drive. Finally, the National Council enjoined all pharmacies to continue to excel in service delivery to consumers of health, while the leadership of PSN continues to work assiduously with stakeholders and government to redress the myriad of challenges ravaging the practice environment.